She Who Must Be Obeyed makes the best relish. We don’t buy relish in the store anymore as hers is so good. A second plus is that it is made with zucchini. 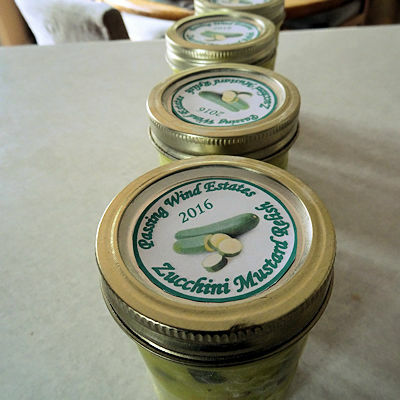 As anyone who grows zucchini knows, it is a good thing to have another good zucchini recipe. I don’t know where we got the recipe. It is one of those an a ratty old piece of paper stuffed in her recipe box. Whoever created it, thank you! I will apologize right now for the lack of pictures. She Who Must Be Obeyed assures me I will suffer great bodily harm if I get in her way while cooking or publish any pictures of her. So, I will just print the recipe. I encourage you to try it. We love it. Mix the zucchini, onion and peppers. Add 250 ml (1 cup) of the cold water and mix. Let sit for 1 hour, mixing occasionally. Put the vegetables in a colander and rinse well with cold water. Press to remove most of the moisture. Mix the sugar, flour, mustard, tumeric, mustard seeds and celery seeds in a large microwave save bowl. Slowly whisk in the vinegar and remaining 125 ml (1/2 cup) water. Microwave on high for 17 to 20 minutes, stirring twice. You are looking for a thickened consistency with the vegetables still crunchy. Sterilize four 250 ml (1 cup) canning jars. Put the relish in the jars and affix canning lids per the manufacturer's instructions. Process 10 minutes in a boiling water bath (20 minutes at high altitude). I can’t wait to try this David! Thanks for sharing! Thanks, Connie. I hope you love it as much as we do. I made a zucchini relish for the first time. If it doesn’t pass our taste test, I will try She Who Must Be Obeyed’s recipe. Goodness knows, we have enough zucchini to try another recipe! We really like it but it isn’t as sweet as the commercial stuff. That is why we like it but you should know. Thanks, Carlee. You must be a mind reader. A friend just said I should post some of my seasonal recipes each year because she forgets about them.